To make the dressing mix all the ingredients in a bowl and set aside. Cook the noodles as per the directions in the package. If you are using Mung bean noodles , you need to boil them in hot water for 3-4 mins till they become transparent and then wash them once in cold water and drain the noodles to remove all the water. With scissor , cut the noodles cross wise so that they are easy to mix. In a big mix bowl, add the noodles and all the sliced vegetables and mango. Then add the dressing on top and mix well. Sprinkle the roasted peanuts and serve. Note : This salad taste better if it is chilled for half an hour before serving. 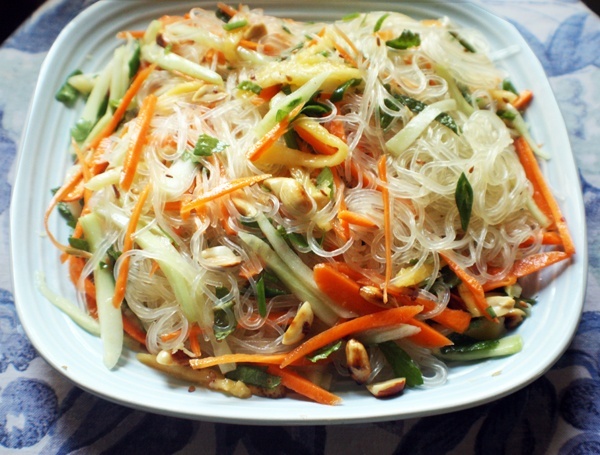 This entry was posted in All Recipes, Salads and tagged Asian Noodle Salad, Cold Salad, Easy Salad, Summer Salad by Kamakshi. Bookmark the permalink.